Background Good interpersonal relationships can improve the negative mood and, to a certain extent, may help relieve dysmenorrhea symptoms. However, there has been no study examining the role of interpersonal relationships in dysmenorrhea and how they may interact with negative emotions. Aims To investigate the connection between negative affect and dysmenorrhea, and the role of interpersonal relationships plays in this relationship. Methods The Cox Menstrual Symptom Scale (CMSS), short-form of Depression Anxiety Stress Scale, Interpersonal Comprehensive Diagnostic Scale and UCLA (University of California at Los Angeles) Loneliness Scale were applied to 855 adolescent nursing students to collect information on severity and frequency of dysmenorrheal symptoms, negative emotions (including depression, anxiety and stress), interpersonal problems and subjective experience of loneliness among them, and the relationship among these variables was examined. Results (1) Both the severity and frequency of dysmenorrhea were positively correlated with negative emotions, loneliness experience and interpersonal problems, while negatively correlated with age at menarche. (2) The negative emotions, romantic relationship and menarche age, but not loneliness and interpersonal problems, significantly contributed to both the severity and frequency of dysmenorrhea. (3) Mediation analysis revealed that the effects of loneliness and interpersonal problems on dysmenorrhea were totally mediated by negative emotions. Conclusions This investigation indicates that the relationship between interpersonal relationships and dysmenorrhea is mediated by negative emotions. Good interpersonal relationships can improve the negative mood and, to a certain extent, may help relieve dysmenorrhea symptoms. Studies have shown that being married or in a stable relationship could be protective factors of dysmenorrhea.6 However, there has been no study examining the role of interpersonal relationships in dysmenorrhea and how they may interact with negative emotions. This study aims to investigate the effect and potential interaction of negative emotions and interpersonal relationships on dysmenorrhea. After obtaining the approval of the hospital ethics committee and the informed consent of the subjects, the researchers of this study randomly selected 881 students from the 20 out of 52 classes (2100 students in total) in the nursing professional technical secondary school, by using the cluster sampling method from March 2018 to June 2018. In the end, 855 valid questionnaires were obtained, and the effective response rate was 97.0%. Participants with any kind of mental illness (such as mood disorder), substance/alcohol abuse, confirmed pelvic disease and those who took weight loss pills or diuretics within 6 months were excluded. The flowchart of the study is shown in figure 1. The flowchart of the study. Dysmenorrhea information questionnaire: this questionnaire was revised according to the research purposes, which included items on dysmenorrhea and demographic information, such as age, height and weight. The questionnaire included one item on whether they were in a romantic relationship and one item on age at menarche. Interpersonal Comprehensive Diagnostic Scale (ICDS)14 is a 28-item self-report questionnaire that comprises items capturing troubles in interpersonal relationships. The ICDS examines troubles in conversation, making friends, manners and heterosexual interactions. All items are rated on a yes/no scale, that yes is scored 1 point and no is scored 0, and a higher score indicates more serious troubles in interpersonal relationships. In our sample, the reliability of the ICDS was good (Cronbach’s α=0.803). Data were analysed with SPSS 18.0. First, the correlation among frequency and severity of dysmenorrhea, negative emotions (including depression, anxiety and stress and total scores of DASS-21) and interpersonal relationship (including ICDS and ULS scores) in the subgroup of sample (n=807) that reported at least mild dysmenorrhea (the participants who rated 0 on either CMSS severity or frequency subscale were excluded, n=48) were examined using Pearson’s correlation. Second, linear regression analyses were performed to test the contribution of interpersonal relationships and negative symptoms on dysmenorrhea. Finally, a bootstrapped moderated mediation model in SPSS15 was used to test whether negative emotions (DASS-21 scores) mediated the relationship between dysmenorrhea symptoms (CMSS severity and frequency scores) and troubles in interpersonal relationships (ICDS scores and ULS scores) among individuals with dysmenorrhea. This study included 855 female adolescents. The mean age was 16.87 (0.89) (14–19 years). Average menarche age was 12.85 (1.05). The average body mass index was 19.96 (2.29), which was in the normal range (18.50–24.99). There were 48 cases (5.6%) that reported no dysmenorrhea symptoms, and the rest of 807 (94.4%) reported having mild to severe dysmenorrhea. The demographic information and scale measurements of participants with and without dysmenorrhea are illustrated in table 1. Correlation analysis was performed in the 807 participants with dysmenorrhea, and the results of correlation analyses are presented in table 2. 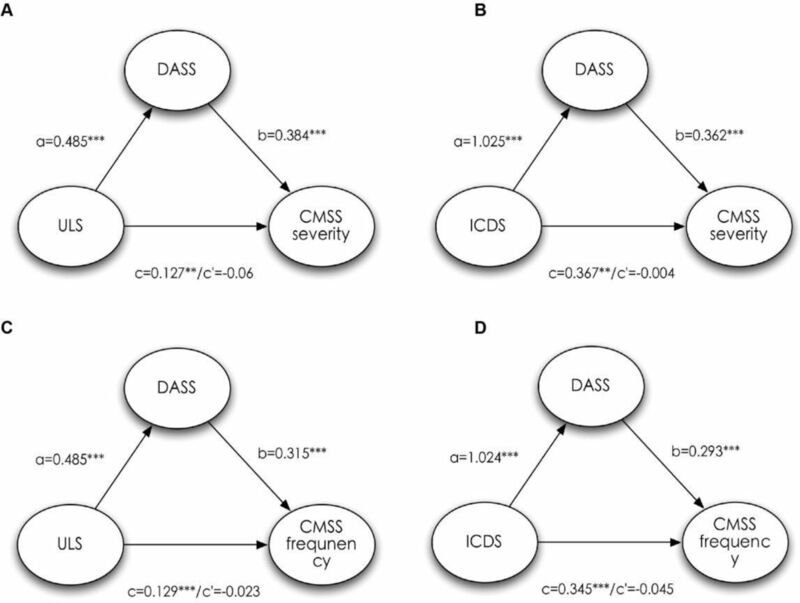 The CMSS severity subscale was positively correlated with the depression, anxiety, stress subscale and total score of DASS-21, and ULS and ICDS scores (p<0.001 for all correlation coefficient). And there was significantly negative correlation between CMSS severity and menarche age (p=0.042). No significant correlation was found between body mass index (BMI) and CMSS severity scores. The CMSS frequency subscale has a similar correlation pattern as CMSS severity. Positive correlation between CMSS frequency, DASS-21 total and all three subscales, and ICDS and ULS scores was found (p<0.001 for all correlation coefficient). Significant negative correlation between CMSS frequency and menarche age (p=0.012) was also found (table 2). To test the contribution of negative emotions and interpersonal relationship on dysmenorrhea, a multiple stepwise regression analysis was performed. The DASS-21 (total scores), ICDS (indicating troubles in relationship), romantic relationship (‘in-love’ coded as 1 and ‘not-in-love’ as 0, romantic relationship considered as a typical type of relationship in adolescents), ULS (indicating subjective experience of loneliness in relationship), BMI and menarche age were inserted as predictors and CMSS severity (or CMSS frequency) as the dependent variable. The BMI and menarche age were used as predictors as they were reported to have affected dysmenorrhea symptoms in previous studies.6 The results indicated that the variation of CMSS severity was best explained by the effect of negative emotions (DASS-21, β=0.359, p<0.001), romantic relationship (β=−0.113, p<0.001) and menarche age (β=−0.074, p=0.031). A similar pattern was also exhibited when CMSS frequency was used as the dependent variable (DASS-21, β=0.326, p<0.001; romantic relationship, β=−0.090, p=0.010 and menarche age, β=−0.086, p=0.015). The contribution of romantic relationship on dysmenorrhea was of interest since previous studies suggested that a stable relationship may be a protective factor of dysmenorrhea. We thus divided the 782 participants with dysmenorrhea who reported if they were in a romantic relationship into the ‘in-love’ group (n=134) and ‘not-in-love’ group (n=648), and compared the CMSS, ICDS and DASS-21 measures between these two groups. Intriguingly, we found that (1) the ‘in-love’ group scored higher on both severity (t780=4.575, p<0.001) and frequency (t780=3.845, p<0.001) subscale of CMSS, and all three subscales and total scores of DASS-21 (t780=2.147, 3.018, 2.931 and 3.068 for stress, anxiety, depression subscale and total score of DASS-21, p=0.032) than the ‘not-in-love’ group; (2) both groups exhibited similar correlation patterns among CMSS scores and ICDS and DASS-21, except that ULS and stress scores of the ‘not-in-love’ group were significantly correlated with CMSS symptoms, but not in the ‘in-love’ group (table 3). We further investigated the mediating role of negative emotions in the relationship between interpersonal relationships and dysmenorrheal symptoms. Four moderated mediation models were set up with CMSS severity or CMSS frequency as dependent variables, and ICDS or ULS as independent variables, respectively. The DASS-21 total scores were inserted in all models as a mediator. The results of mediating analyses are illustrated in figure 2. The intermediary role of negative emotions in the interpersonal relationship and dysmenorrhea. (A,B) The effect of ULS on severity of dysmenorrhea was totally mediated by DASS-21. (C,D) The effect of ULS on frequency of dysmenorrhea was totally mediated by DASS-21. 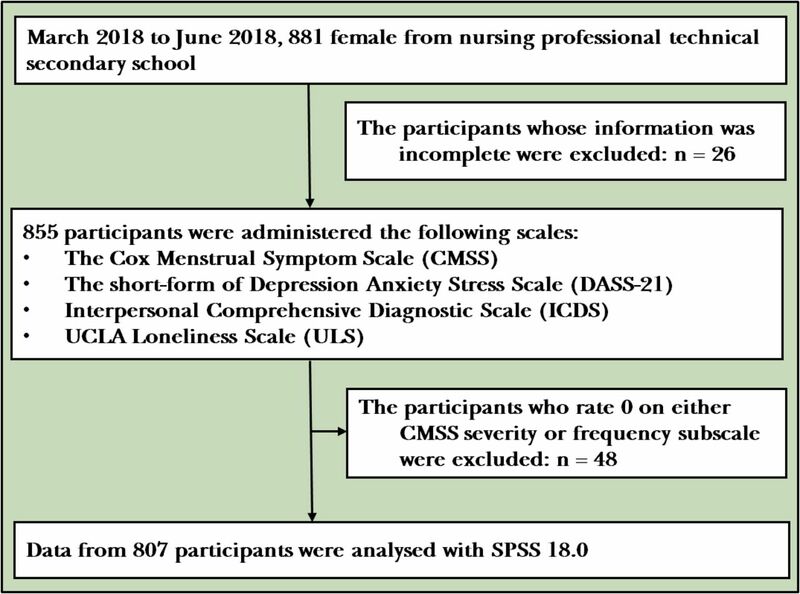 CMSS, Cox Menstrual Symptom Scale; DASS-21, Depression Anxiety Stress Scale; ICDS, Interpersonal Comprehensive Diagnostic Scale; ULS, UCLA Loneliness Scale. For CMSS severity, the effect of ICDS on dysmenorrhea was totally mediated by DASS-21 (ab=0.371, SE=0.044). The indirect effect of DASS-21 was found to be significant as the 95% bias corrected bootstrapped confidence interval (95% BCCI 0.273 to 0.482 with 5000 resamples) excluded zero. Similar results also exhibited when using ULS scores as independent variable (ab=0.186, SE=0.022, 95% BCCI 0.138 to 0.241). For CMSS frequency, similarly, the effects of ICDS (ab=0.300, SE=0.042, 95% BCCI 0.213 to 0.404) and ULS (ab=0.152, SE=0.020, 95% BCCI 0.108 to 0.202) on dysmenorrhea were both totally mediated by DASS-21 as well. Using the scale investigation, this study aimed at investigating the relationship among negative emotions, interpersonal relationships and dysmenorrhea. We found that: (1) both the severity and frequency of dysmenorrhea were positively correlated with negative emotions (ie, depression, anxiety and stress) and loneliness experience and interpersonal problems, while negatively correlated with age at menarche; (2) the negative emotions, romantic relationship and menarche age, but not loneliness and interpersonal problems, significantly contribute in both severity and frequency of dysmenorrhea; 3) the mediation analysis revealed that the effect of loneliness and interpersonal problems on dysmenorrhea were totally mediated by negative emotions. The present study found that troubles in interpersonal relationships, that is, interpersonal problems and subjective experience of loneliness, are associated with severity and frequency of dysmenorrheal symptoms. These results suggested that the participants with worse interpersonal problems or loneliness experience tend to have worse dysmenorrheal symptoms. These results are consistent with previous studies. In a meta-analysis of 63 studies (with a sample of 64 286 women), Latthe and colleagues found that being married or in a stable relationship were associated with reduced risk of dysmenorrhea, suggesting that a stable interpersonal relationship might be a protective factor of dysmenorrhea.6 However, further linear regression analysis revealed that neither ICDS nor ULS has contributed in the variations of dysmenorrheal symptom measures, suggesting that the correlation between ICDS (or ULS) and CMSS was probably mediated by other factors. The study has the following limitations: (1) The samples’ age was from 15 years old to 19 years old and the samples that we chose were female and adolescents. Therefore, the relationship among dysmenorrhea, negative emotions and interpersonal relationships found in this study might change if applied to participants with different ages, such as middle age women. (2) Some factors, which were found to be associated with dysmenorrhea, such as pelvic infection and sexual abuse, were not controlled in this study due to the limited conditions in survey; this study did not control whether the subject was at the time of the menstrual period. We agree that the status of the subject at the time of filling the form does affect the results of the CMSS to a certain extent. However, CMSS itself is a retrospective evaluation of the symptoms of dysmenorrhea in the past. Participants can clearly understand that we are not evaluating the pain at the time but the pain before and after menstruation. This study indicates that negative emotions totally mediated the effect of interpersonal problems and dysmenorrheal symptoms. The authors thank all the participants on this project.
. [Reliability and validity of Chinese version of COX Dysmenorrhea Symptom Scale]. Shandong Zhong Yi Da Xue Xue Bao. 2015;1.
. Psychometric properties of a Chinese version of the 21-item depression anxiety stress scales (DASS21). Report for new South Wales transcultural mental health centre, Cumberland Hospital, Sydney, 2001.
. [Psychometric Properties of the Chinese Versions of DASS-21 in Chinese College Students]. Zhongguo Lin Chuang Xin Li Xue Za Zhi 2010;18:443–6.
. [Reliability and validity of Russell Loneliness Scale]. Zhongguo Lin Chuang Xin Li Xue Za Zhi 1995;1:23–5.
. Psychological health diagnosis of college students. Jinan: Shandong Education Press, 1999.
. Sensory, motivational and central control determinants of pain: a new conceptual model. The skin senses 1968;1.
. The medial and lateral pain system-parallel processing of nociceptive information]. Zhongguo Shen Jing Ke Xue Za Zhi 2003;19:416–9. Lingli Mou received a bachelor's degree in medicine in 2016 and began studying for a master's degree in the same year in Southwest Medical University. She is receiving the standardized training of resident doctors in the department of psychiatry and successfully obtained the qualification certificate of medical practitioners. Her main research interest is depression. Contributors LM contributed to imaging analysis, interpretation of results and writing of the manuscript. WL contributed to designed the study and manuscript editing. JC and RZ contributed to subject recruitment and study implementation. KL contributed to data analysis and manuscript writing and editing. XL designed the study and was involved in all aspects of implementation and report writing. All authors contributed to and have approved the final manuscript. Funding This work was funded by the Sichuan Provincial Science and Technology Department (2017JY0324), Joint Project of Southwest Medical University and Sichuan Luzhou (2017LZXNYD-Z02), Natural Science Foundation of China (81701322); Humanity and Social Science Youth Foundation of Ministry of Education of China (17YJC190001, 17YJC190009), the joint project of Southwest Medical University & Affiliated Hospital of Southwest Medical University (2015-QB-003); Sichuan Applied Psychology Research Center Project (CSXL-172012). Ethics approval The study has been approved by the Affiliated Hospital of Southwest Medical University Institutional Review Board in August 2017 (number: R2017068).